IMPACT! Volunteers spend a day lending a hand at the Cleveland Kids' Book Bank. Giving of yourself – it’s one of the biggest mitzvot (good deeds) you can do. Volunteers can give their time through ‘Done in a Day’ opportunities. IMPACT! Done in a Day Volunteer Opportunities match a volunteer’s interest to help with a community need that is personally meaningful. This individualized approach assures the best experience for volunteers and connects them directly to the mitzvah of tikkun olam (repairing the world). “I think when you get a taste of what is out there, it draws you in to looking for the next opportunity to volunteer,” volunteer Laura Salkin said. IMPACT! 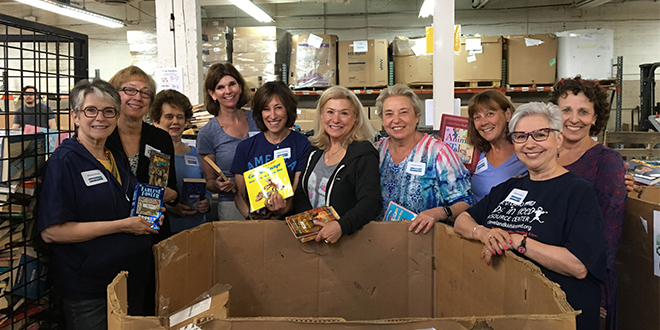 and the Federation's Jewish Volunteer Network (JVN) offer a variety of opportunities to participate throughout the community including sorting books for children in need at the Kids' Book Bank, distributing produce at the Greater Cleveland Food Bank, and helping stock shelves and sort clothing at the Cleveland Chesed Center. Sign up now for some of our summer Done in a Day volunteer opportunities! For information on Done in a Day volunteering or any other volunteer opportunity, contact Susan Hyman at shyman@jcfcleve.org or 216-593-2887.